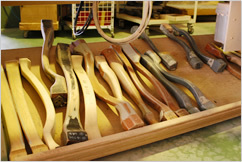 The precursor of Maruni Wood Industry was Showa Mageki Kojo (Showa Bentwood Factory). Founded in 1928, this company established the technique of bentwood working that was considered extremely difficult at the time. 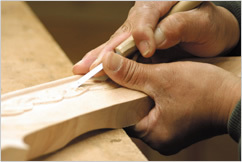 The name of the company was changed to Maruni Wood Industry, Inc. in 1933, after which the company set about achieving the industrial application of crafts skills in distinction to traditional Japanese methods of furniture production, which had remained until then firmly rooted in the field of the handicrafts. This was thus one of the first Japanese companies to aim at creating and mass-producing furniture on the basis of a division of labor and with recourse to methods that did not entail reliance on the manual skills of artisans. After the end of the Second World War, Maruni Wood Industry set about introducing new techniques acquired in the course of research and development carried out in connection with artificial methods for drying wood. A wide variety of reforms was introduced into every stage in the production process from getting holding of the materials through to the final stages of completion through such research and through the acquisition of rational methods of production developed in Europe. During the 1960s Maruni on its own developed carving machines and other types of machines for use in the production process with the aim of giving rise to ever more sophisticated woodworking techniques. The company thus acquired the skills needed to produce on a fully industrialized basis items of furniture incorporating sculpted carvings, a type of furniture that had until then been produced in the form of single units and had been regarded as extremely high class. 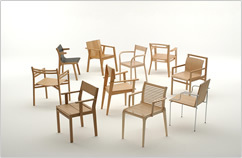 The classic furniture developed by the company in 1968 continues to enjoy a reputation today as amongst the most successful examples of Western-style furniture ever produced in Japan. The company achieved a production output of 2,500 items per month, at the time a quantitative record for furniture production in Japan. 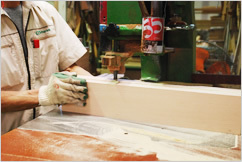 Maruni Wood Industry thus developed into Japan’s most celebrated manufacturer of classic furniture, growing to the extent that the company came to occupy the prime position in Japan in term of sales as a manufacturer of high-quality furniture that evokes a traditional sense of beauty. Maruni’s consistent aim has been to convey to as many people as possible in Japan the beauty of Western furniture, and especially classic furniture, which contains many features that have to be created through the application of painstaking handicraft skills and has traditionally been regarded as high class, at prices that ordinary people can afford. In order to achieve this goal Maruni tackled technical development and design research with the aim of realizing industrial applications of crafts techniques, but the company eventually reached a turning point in its development. While attempting to respond appropriately from the 1990s onwards to the collapse of the Japanese bubble economy, the increasing trend towards deflation, the inflow into Japan of cheap products from other Asian countries, the diversification of lifestyles and other changes impacting on the market, Maruni began to get extremely worried that the desire for “beautiful furniture” was becoming increasingly stultified. This sense of impending crisis motivated the company to set about returning to its original starting point. The idea was to return to the point of departure for furniture and to explore once again what chairs are really all about. It was in this context that Maruni was presented with a raft of new ideas by the architect and product designer Masayuki Kurokawa. This was the concept that marked the launch of the “nextmaruni” project, which got under way in 2004. Up until then, Maruni had been engaged in every aspect of the production process from planning and design through to manufacture. However, in the case of this new project, an entirely new method was adopted, with twelve designers from all over the world, including several who took part in a competition sponsored by Maruni, being asked to come up with their own designs so that Maruni could concentrate exclusively on the manufacturing process. The designers had to tackle the design topic of “chairs conceived as a message directed towards the Japanese aesthetic.” Designers including Alberto Meda from Italy, Jasper Morrison from the UK, and Naoto Fukasawa from Japan came up with materials, forms and ideas that explored the possibilities inherent in the Japanese aesthetic. The collaboration between these designers and Maruni, with its capacity to recreate faithfully and intricately the ideas proposed by these designers, resulted in the creation of beautiful new forms that attracted attention from all over the world. 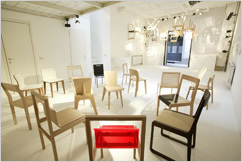 This project was all about a fusion between culture and industry that involved giving serious to consideration to the physical form of chairs as art works and as commodities in terms of the nature of the aesthetic and of the method of production that would distinguish these items as intrinsically Japanese products as well as in terms of thinking about the essence of everyday living. This became the new starting point for Maruni’s production activities. The “Hiroshima” series was released in 2008 with the aims of looking into what exactly Maruni Wood Industry should be creating and of trying to throw light on the starting point for the company’s activities. This new venture was entered into in partnership with the internationally renowned Japanese product designer Naoto Fukasawa. Our aim was to create furniture that combines robustness with designs that will remain fresh and vital in a hundred years’ time. 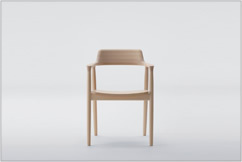 In order to create new standards of the highest quality, there is a need for technology rooted in a thorough knowledge of wood and furniture production in connection with form, seating comfort, the combination of robust structure and lightness for ease of handling, and delicate finishing that makes the most of the superior qualities of wood. This is the approach that we all share and which we apply to the joint creation of our products. The “Hiroshima” series in particular reflects the Japanese aesthetic as applied to wood and the skills that make it possible for this aesthetic to be brought to life in everyday contexts. Products in this series therefore have a natural wood finish with almost no paint or varnish. 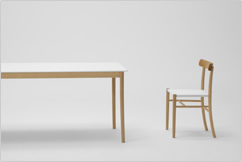 The “Hiroshima” series presented at the Milan Salone in 2009 attracted a great deal of attention and is now supplied to 20 countries around the world, including the United Kingdom, Germany, France, Canada, the United States, and so on. These are products that fuse an international design sense with Japan’s unique aesthetic as applied to wood and intricate manufacturing skills. They may thus be thought of as items of furniture projected by Japan into the world and created in the manner unique to Maruni Wood Industry and, as such, they represent a crystallization of beauty born out of craft skills. Since 2010, Maruni Wood Industry has worked with Naoto Fukasawa as art director to take our first steps toward establishing the Maruni Collection throughout the world as a brand of distinctively Japanese furniture. Beginning in 2011, we are joined by designer Jasper Morrison as we strive to elevate the Maruni Collection to even higher recognition. Maruni Wood Industry will continue to create beautiful Japanese furniture that strikes a chord amongst people all over the world.